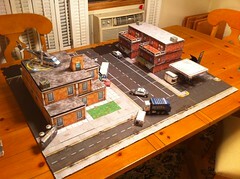 The following are some pics of my All Things Zombie board. It is still a work in progress but we were able to play two games on it today. We played an "escape scenario" both times with the objective of getting to the roof of the police station and boarding the helicopter. Notice the front door of the police station is blocked by the crashed bus so the players had to run around the back to another door. The first game the players deployed at the gas station and successfully escaped. 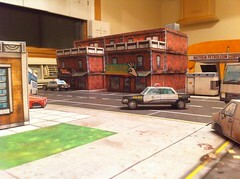 The second game they deployed in the third floor bedroom above Greasy Joe's and were unsuccessful, one player falling at the street level exit of the apartments and the other two at the back door of the police station. That's a very nice looking board! Hi Noticed you had parking spots on the street where did they come from? what did you use to base the playing field on? "Conan, what is good in GMing?" "To crush the PCs, see their character sheets stacked before you, and hear the lamentations of their players." You built a great board for a great game. Do post more when you can. Video games have ruined my life . . . good thing I have 2 more. There are three kinds of people in this world. Those who can count and those who can't. Thanks all. 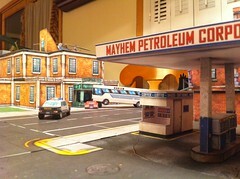 I will post more pics as I complete more of it, especially the interiors of the buildings when all the props are done. I am printing out a few new pieces right now actually. 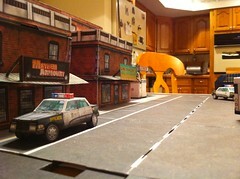 grg3d, the parking spaces, and all the street tiles, are from the Streets of Legend set. I did modify some of the tiles though so that the crosswalks are where I want them and also the sidewalk corners in front of the gas station. 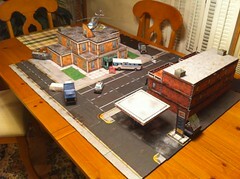 All of the tiles are mounted on black foam core, 3/16" thickness I think it is. Next there is going to be a traffic circle next to the apartment building and a smaller building and parking lot is in the works for behind the police station.